Dating back to the fourth century, the Basilica of San Lorenzo Maggiore in Milan is one of the oldest churches in Milan and Italy as a whole. For forms and architectural solutions it is also one of the most important masterpieces of the Middle Ages and Early Christian art, but also represents a fundamental model for other famous temples of Christianity, such as the Basilica of San Vitale in Ravenna. When the basilica was erected in its original version, Milan was a Roman city, with Theodosius as emperor. The basilica was originally located outside the city, on an artificial hill. To its construction, the Basilica was the largest central-plan building of the West. In 1071 the church was destroyed by a great fire. The dome is then the first half of the seventeenth century, because the previous one suddenly collapsed in 1573, fortunately without causing casualties. The main body of the basilica follows a central system, and consists of a square with rounded sides in four large vestibules. In the corners there are four towers, now severed and partially ruined. At the center there is the octagonal lantern, which hides the inner dome. Various chapels are connected to the main body, some of them have been added after the original construction of the basilica. The main chapel is the Chapel of Sant'Aquilino. Completing the imposing structure there are of the four bell towers, square-shaped, of moderate height. It is the part of the monumental complex of San Lorenzo which has preserved in its entirety the original structure. Through an atrium forceps (a square room with two apses) you enter the building, with an octagonal outside and inside articulated by semicircular and rectangular niches. The original dome, which has approximately 1600 years and is perfectly hemispherical and with umbrella shape: the ribs are made of clay pipes which fit one inside the other. This construction technique was used from the second century, and was used to create lighter structures and reached its peak in Ravenna in the sixth century. 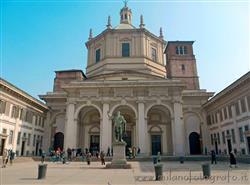 Search Basilica of San Lorenzo in the section Photography!